Cloth patch for the Canterbury Mounted Rifles Regiment, worn on both sides of a soldier’s puggaree (hatband) from October 1917. 1st (Canterbury Yeomanry Cavalry) Squadron. Cap badge: Fern-wreath surmounted by a ram’s head and the letters ‘CYC’. Collar badges: A ram’s head above the letters ‘CYC’. Motto: Pro focus et patria (For home and country). 8th (South Canterbury) Squadron. Cap badge: The Earl of Ranfurly’s Coat of Arms and Crest. Collar badges: The Earl of Ranfurly’s Crest. Motto: Moveo et profitor (By my actions I am known). 10th (Nelson) Squadron (renamed 10th (Nelson & Marlborough) Squadron in 1917 after the parent unit in New Zealand was renamed). Cap badge: A stag’s head over the regimental motto. Collar badges: Smaller version of the cap badge. Motto: Rem gero stenue (Fight with zeal). These squadron designations were intended to represent each of the three Territorial Force mounted rifles regiments from which the CMR drew its personnel. As far as possible, each squadron drew its recruits from its geographical region until September 1917. 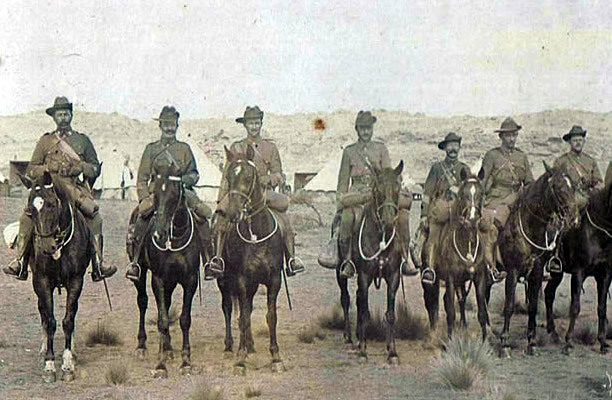 From then on, men were sent overseas as generic mounted rifles reinforcements but were still generally assigned to their region’s unit.